This Kale & Farro Salad has become a weekly staple in our home. It's filled with nutrient-packed greens, tart and sweet fruit flavors and hearty grains. 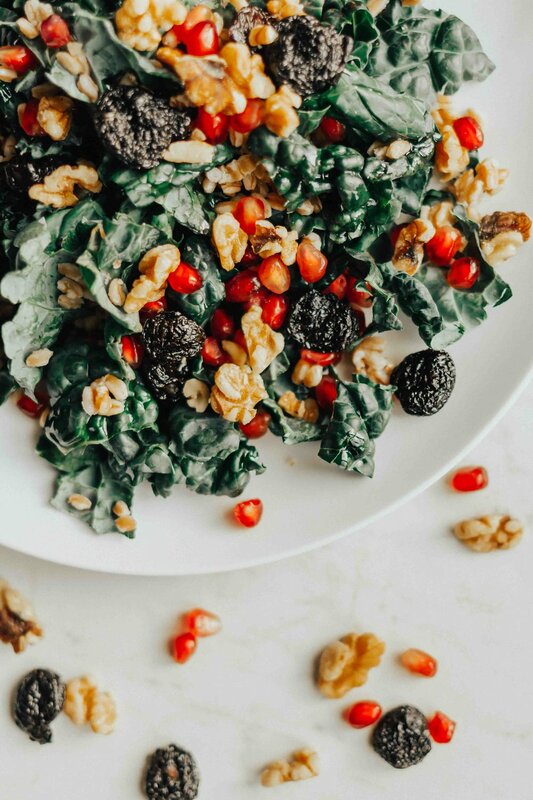 It's incredibly filling and satisfying at the same time and although it's been pegged as a "fall" salad, we have been enjoying this kale salad recipe year-round. Combine farro with 2 cups water in a pot, bring water to a boil then lower to a simmer. Cook covered until farro is tender, about 30 minutes. In a large bowl, drizzle kale with 2 teaspoons olive oil and season with salt and pepper. Add farro to bowl and drizzle with half of lemon oregano dressing. Toss to coat salad with dressing to your liking. Plate salad and top with walnuts, pomegranate seeds, and dried cherries.